With sobering and heavy heart, i am writing in respect to the genocidal war declared on us vulnerable,harmless and harmless Biafrans in this blood sucking contraption called Nigeria and even in the safety of our home land (Biafra) by the Hausa/Fulani beasts in uniform. It is no longer a news that this British experiment called Nigeria was built and sustained on the blood of innocent Biafran. As this useless lorry (Nigeria) is gravitating into the abyss,the sycophants in the political driver-seat of the lorry had been using the innocent Biafrans as sacrificial lamb to pacify the jerking and troubled lorry. Just 35yrs into this Lugard's concoction, in 1945 to be precise,the first genocide was unleashed on Biafrans, when they were wantonly slaughtered in their hundreds on the streets of northern Nigeria by their supposed fellow country men from the Hausa/Fulani extraction of the zoo called Nigeria. In 1953 the demonic colonial masters (British government ) Systematically sponsored and engineered the Hausa/Fulani oligarchy to carry out another genocide on Biafrans, hundreds of our young men and women were massacred. Despite all these atrocities and genocide committed on us, the parasitic British government swept it under the carpet and dangled the carrot of a peaceful and better Nigeria before us,thereby convince us back into the unholy marriage. It was not sooner than 1966 when the third genocide were meted on us again. That 1966 pogrom left thousands of our young men, women and Children dead,as our people were hunted and hounded on the streets of west and northern Nigeria. 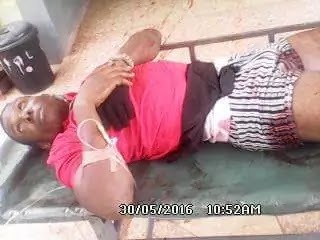 Abandoned by the federal government of their supposed country,Biafrans were left to nurse their wounds unattended. As marginalization,disenfranchisement,subjugation,flagrant abuse of our people's right worsened,the late people's general, (Gen. Chukwuemeka Ojukwu) proposed confederal system of government,but because of their brutal display of arrogant of power, nigeria government refuted that proposal. Our leader had no other choice than to disembark from this blood sucking marriage(Nigeria) that have refused to work in 1967,thereby declaring the sovereign nation of Biafra 50yrs today. While nursing our wounds in the safety of our homeland (Biafra) Nigerian government declared war on us which resulted to the greatest tragical and genocidal war ever after the jews holocaust. 3.5 million men, women and children who died during the British sponsored war of extermination against Biafrans. Since 1970 after the war ended till date,it has been from marginalization, disenfranchisement, state-sponsored ethnic cleansing against our people, economic emasculation, ill human and degrading treatment, Still we continued to comfort ourselves and nurse our wounds, waiting patiently for a messiah that will come someday in the unknown future that will deliver us from this abominable contraption that was built to self-destruct. Thanks to Mazi Nnamdi Kanu, the Joshua of our time,who came with the message of restoration and hope,and we are following him relentlessly even when he is still in dungeon, as he lead us back to the promise land. But because of flagrant display of arrogant of power,Nigeria government led by Mohammad Buhari sponsored another genocide against us on this day the 30th of may 2016 as our people gathered in Nkpor Onitsha Biafra land to pray and pay homage to the memories of our fallen heroes and heroines who lost their lives in a bid to defend our land. As they were having their night rest in a catholic church in Nkpor around 2am this morning they were invaded by the murderous combined Nigeria security agency who came and spread live bullets on them,living dozens of our young men dead and seriously injured. These genocides must stop,it's time the international community stop toiling with the lives of innocent Biafrans, it is time we rise up and defend our land, it is indeed time we activate our right to life,we the indigenous people of Biafra have decided to take our destinies by our own hands,to disembark from this contraption called Nigeria and to restore our nation Biafra. It is either Biafra or death,give us Biafra or kill all of us,no retreat no surrender. BIAFRA GENOCIDE MUST STOP. By Monday Joseph of the family writers.